If a new hourglass figure is one of your New Year’s resolutions, Kim Kardashian and many other celebs may have you thinking that whittling your middle is a cinch. However, waist shapers, appropriately named, are actually a waste of time. So don’t believe everything on your social media feed as you prepare to shape up in 2016, ladies. 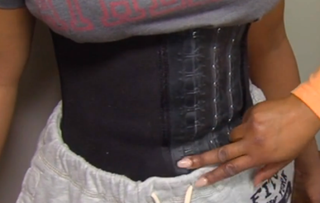 Here is why waist training can be dangerous and should, therefore, be avoided. If you are thinking of joining the waist-training bandwagon, think again.There is no proof that wearing a corsetlike device for hours at a time will compress your core and decrease its size permanently over time. As in absolutely none. Period. Not even while you are sweating. In fact, this iffy practice actually prevents you from using your abs, since this 500-year-old (abolished for a reason) undergarment does the support for you. Your muscles get no play and, over time, could start to atrophy. Read: waste away because of lack of use. So now that your core muscles have forgotten how to work, let’s add your lungs and ribs to the list. For example, what would happen if you were to hold a hose tightly while it was on? The water wouldn’t come out. Duh. Well, the same goes for your breath when you cinch your middle in a corset. In fact, some women have reported passing out as a result of this boalike constriction, according to Mount Sinai Hospital weight-loss-and-nutrition expert Christopher Ochner, Ph.D. And, worse, if you continue to wear it for an extended period of time, you risk crushing your organs, compressing your lungs, fracturing your ribs and even increasing your chances of developing acid reflux disease. An hourglass figure with a whittled middle is a body type that many desire nowadays. That’s true. However, spot reducing—as in trying to reduce the size of only one area of your body—doesn’t happen. You simply cannot reduce the collection of fat in any one particular area of your body. Yes, you may be pushing in your stomach every time you lace up in a waist shaper; however, the moment you release those laces, all that fat will go right back to where it was. No matter how many hours you wear it. So what does work to shed pounds around your belly? Eating healthy and being active on a regular basis. It’s not trendy, it won’t give you microwave results the way waist trainers promise to, but it’s the one sure thing that works. Period. Try it. Speaking of trends, remember when planking was the “it” game a few years ago? Well, that is one movement (pun intended) that we should all be welcoming back. The ability to hold your body flat against gravity may have gone viral then, but the plank is still a super-beneficial practice today. This popular total body and core stabilizing exercise, coupled with moves that challenge your balance, is better than any ungodly amount of crunches you can do. Plus, if you also try adding some rotational moves, like an abdominal twist in between your squat reps, you will certainly be doing more for your core than any laced-up piece of metal could ever do. Three options for one strong midsection.